Real Flame Stencil -KB Fire 3- [RFstencil-KBfire3_1/64] - $8.50 : FlameMasks!, The Original :: Empowering YOUR creative Airbrush needs since 2001! KB's third exclusive design hand held stencil developed specifically for aiding the creation of "realistic/true" fire on the tiny scale of 1/64 diecast cars. With this stencil, a good airbrush, and some practice, you will be capable of producing some very realistic fire on even the small scale of 1/64. 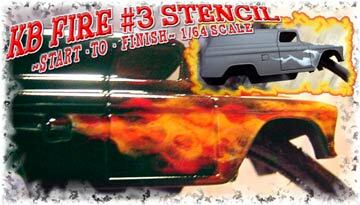 This stencil is specifically designed for creating "ends" or "tips" of the flames, which on 1/64 scale, can be one of the most difficult things to accomplish. It can however be used to create the entire flame as well as the tips. NOTE: While this stencil is capable of producing great results by itself, most users will find it to their advantage to have other designs available to them as well. Thus, this design and others offered here will increase the users results of obtaining a unique variation of flame pattern easily and with every project.